The real stars of the Oscars rode in on a tour bus. 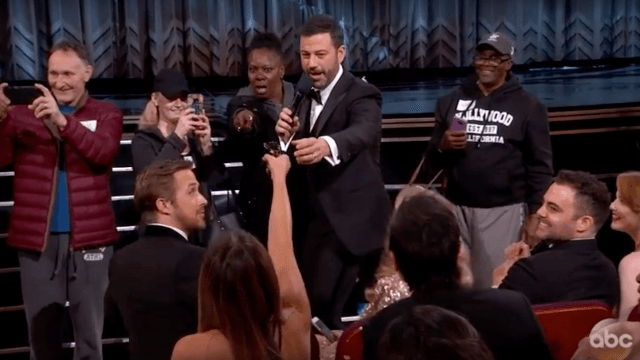 Up until the Best Picture fiasco at the end of Sunday night's Oscars, the stars of the show were an unsuspecting group of Hollywood tourists that Jimmy Kimmel brought into the Dolby Theater on live television. These folks were riding what they thought was just a regular old Hollywood tour bus, and that they were getting off the bus to see an exhibit of Oscars dresses and gowns. What they didn't know was that those gowns would be on actual celebrities. The tourists were able to take selfies with the likes of Meryl Streep and Ryan Gosling and hold Mahershala Ali's Oscar for Best Supporting Actor. Denzel Washington even "married" an engaged couple who said he was their favorite actor. Unsurprisingly, Twitter had a lot of feelings about the tour bus bit. Gary from the tour bus carrying his fiance's purse at the Oscars is my Halloween costume this year. OSCAR PRODUCER: The show is always too long. What should we do? KIMMEL: Bring in a tour bus of people for like 45 minutes? Here's hoping this was enough to land Gary a hosting gig for the 2018 Oscars.